Every once in a while I run across a recipe that is so good, I want to make it all the time. I want to feed it to guests and I want to have a secret hoard in the frig just for myself. I want to keep a bag of croutons to dip into the dressing for a snack. This dressing is one of those. I love that tanginess of the goat cheese, buttermilk and lime flavors, with the garlicky, chili, fresh herb notes mixed in. I first made this dressing a number of years ago, and had some left over from the romaine and orange-chili crouton recipe. So I began to experiment with using it on other salads. That was when I discovered how amazing it was on the red potato and green bean salad I was trying out. I have used it exclusively on every potato salad I have made since. Actually, I have been trying to photograph the red potato and green bean salad for about two weeks now. I cannot seem to get a good enough photo to show how great it is. I am going to try it again this weekend one last time, if I don’t tear my hair out first. 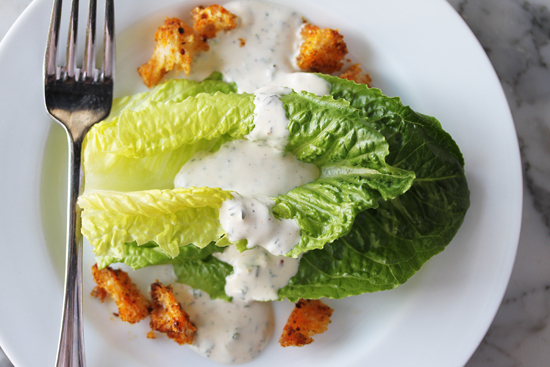 You can use the romaine leaves for a formal kind of presentation, or a more rustic look by pouring about a fourth of a cup of the dressing over a wedge of iceberg lettuce and sprinkle the croutons around. The croutons are like nothing you have ever eaten before. You take the zest of an orange and mix it with chili powder, salt and pepper. Then toss the fresh sour dough croutons in the mixture and finally drizzling garlic infused olive oil over them. Toss them thoroughly to coat and bake til crisp. The combination of the orange zest and chili powder is devastating. One thing about the orange-chili croutons, when you make them, be sure to hide them until it is time to serve them. I once made this dish for guests and left the bowl of croutons out on the counter. Unbeknownst to me, the people going in an out of the kitchen were snacking on the croutons and when it was time to plate, there were only about three croutons left for each salad. Hide them from yourself also…they’re addicting. 2. In a small pan, saute the garlic in the olive oil until just starting to color, about 1 minute. Strain oil into a bowl and discard the garlic. Reserve oil. 4. Bake on a sheet pan until crisp, but not dry, about 12-15 minutes. These salad fixings sound just delicious. I make croutons all the time, but always straight – olive oil and garlic salt, that’s the fanciest I get. Next time I’ll have to try this version. Thanks Lynne! Lynne, yours is the first site I went to after our camp, and it most certainly did not disappoint! Wow! You are amazing!! I’m looking forward to seeing you regularly in my RSS feed!